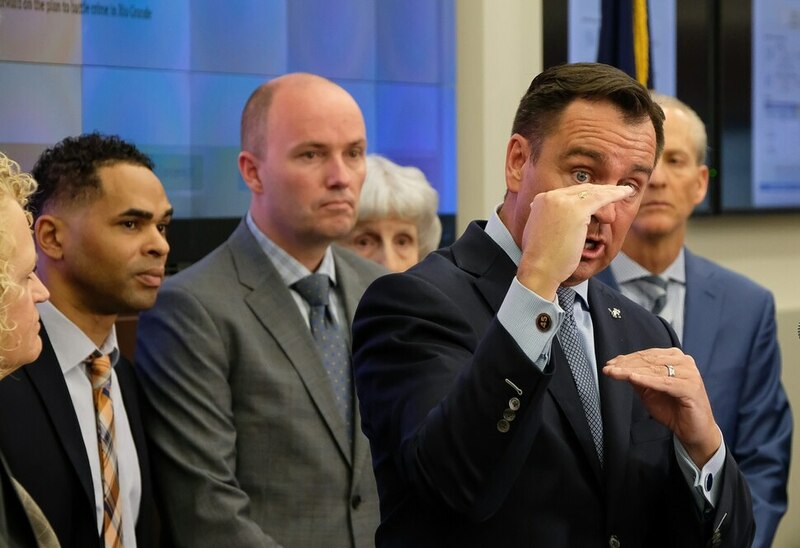 (Francisco Kjolseth | The Salt Lake Tribune) House Speaker Greg Hughes talks about the incremental positive changes happening with Operation Rio Grande which began six months ago. State and local officials provided an update on successes, challenges and current activities taking place to tackle the homeless and drug problem downtown. (Francisco Kjolseth | The Salt Lake Tribune) Rich Deprez, a recovering addict who found himself pulled back in to drugs, talks about turning his life around with the help of Operation Rio Grande, which began six months ago. Surrounded by State and local officials Deprez nervously found the courage to speak during a press event at the Utah Capitol on Monday, Feb. 5, 2018, as officials gave an update to the recent changes. 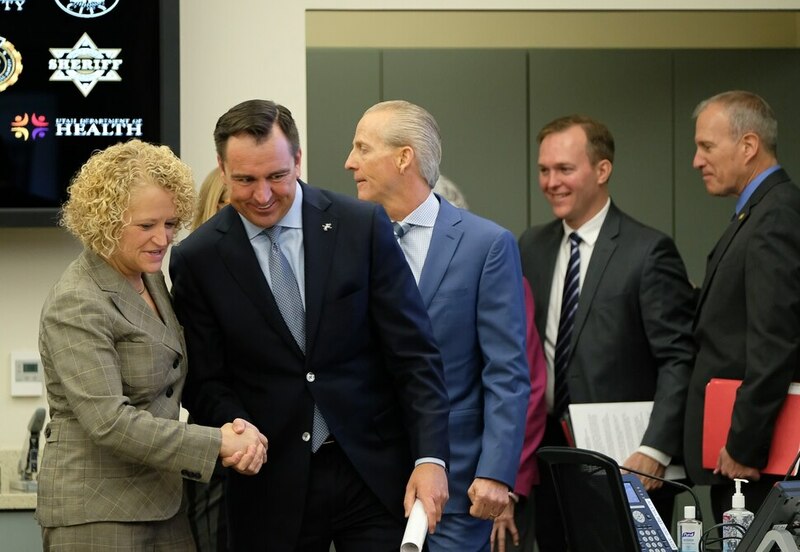 (Francisco Kjolseth | The Salt Lake Tribune) Mayor Jackie Biskupski shakes hands with Speaker Greg Hughes as they get ready to give an update on Operation Rio Grande that began six months ago. 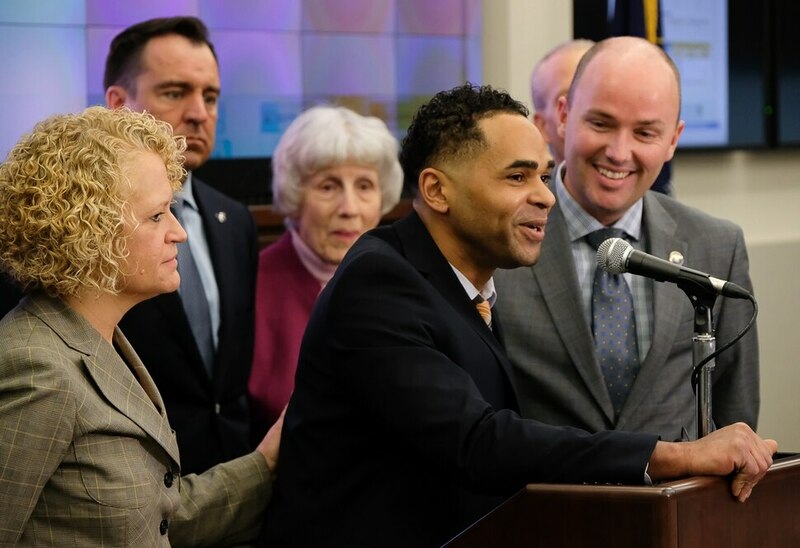 State and local officials provided spoke on successes, challenges and current activities during the press event at the Utah Capitol on Monday, Feb. 5, 2018. ORGUpdate.020618(Francisco Kjolseth | The Salt Lake Tribune) Advocate for the homeless Pamela Atkinson talks about the need for volunteers and her wish to give the pharmaceutical companies a piece of her mind when it comes to the saturation of opioid drugs on the streets during and update on Operation Rio Grande, which began six months ago. State and local officials discussed successes, challenges and current activities taking place to tackle the homeless population and drug use downtown. (Francisco Kjolseth | The Salt Lake Tribune) Rich Deprez, a recovering addict who found himself pulled back in to drugs, talks about turning his life around with the help of Operation Rio Grande, which began six months ago. Surrounded by State and local officials Deprez nervously found the courage to speak during a press event at the Utah Capitol on Monday, Feb. 5, 2018, as officials gave an update to the recent changes. (Francisco Kjolseth | The Salt Lake Tribune) State and local officials provide an update on Operation Rio Grande which began six months ago, during a press event at the Utah Capitol on Monday, Feb. 5, 2018. The politicians leading the two-year transition from a large, centralized homeless shelter in downtown Salt Lake City to a new services-focused model in summer 2019 say they’ve been successful in the six months since they launched the effort. Crime dropped in the Rio Grande neighborhood, they say. Police made 466 felony arrests since Aug. 14, 2017, in the area that they attribute to the effort, and 943 arrests were made for outstanding warrants. Those arrests, along with the focus and federal aid for substance-abuse treatment beds, represent a good start to the two-year effort and will lead to fewer people in homelessness, the leaders say. Hughes and other leaders held a news conference to tout what they said were successes of Operation Rio Grande the day before the speaker and Lt. Gov. Spencer Cox are set to present an update to a legislative budget panel, which will have the chance to dig into the costs of the effort. The officials declined Monday to discuss spending on the operation other than to say departments stretched their budgets to make it happen, adding there would be requests for money from the Legislature this session. The anticipated total cost, they said, remained at the previously estimated $67 million between state and local governments. The plan announced last year calls for closing the 1,100-bed shelter downtown and opening three new smaller shelters, two in Salt Lake City and one in South Salt Lake. State, federal and local officials created Operation Rio Grande, the three-phase, two-year effort to end years of open drug use in the vicinity of the shelter. On Monday they introduced Rich Deprez, from Cedar Hills, who said he relapsed after several years of sobriety after drinking in a bar near Rio Grande on Aug. 26. He was downtown to watch a boxing match, he said. It was the night after he allegedly committed domestic violence, according to a charge in state court. A history of drug addiction caught up with him, he said, when someone outside the bar offered him drugs. He said he’d travel to Rio Grande in search of drugs, but that a dealer told him they were feeling the heat from the police-led effort. Unlike hundreds of others, he wasn’t arrested as part of the effort to clear crime from downtown. But he says he voluntarily entered treatment, which has been a central focus of the ongoing operation. According to the information provided: 70 people have entered treatment through Salt Lake County’s new drug court program. Nearly 200 treatment beds were added since Aug. 14, 2017, when the operation began, and more are on the way. Through the third and final phase, 14 people have found jobs and 100 have plans to find employment, with help from state caseworkers. Businesses willing to hire homeless residents have posted 48 jobs.